This Café bottom freezer refrigerator is designed with the fresh food compartment in the upper portion of the refrigerator and the freezer in the lower portion. With FrostGuard technology, defrosting occurs only as needed, reducing freezer burn in the freezer compartment. The counter depth aligns nearly flush with surrounding cabinetry. The hot water dispenser lets you choose your own temperature or from one of the four pre-programmed settings to simplify hot food and drink preparation. 22.1 cu. 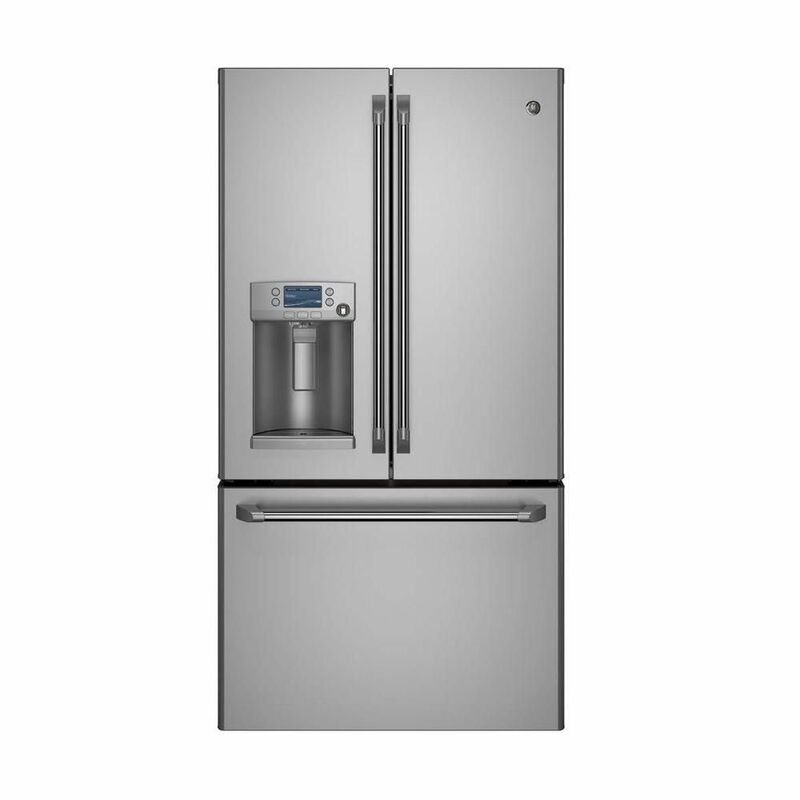 ft. Bottom-Mount French Door Refrigerator with Ice and Water in Stainless Steel - ENERGY STAR® This Café bottom freezer refrigerator is designed with the fresh food compartment in the upper portion of the refrigerator and the freezer in the lower portion. With FrostGuard technology, defrosting occurs only as needed, reducing freezer burn in the freezer compartment. The counter depth aligns nearly flush with surrounding cabinetry. The hot water dispenser lets you choose your own temperature or from one of the four pre-programmed settings to simplify hot food and drink preparation. 22.1 cu. ft. Bottom-Mount French Door Refrigerator with Ice and Water in Stainless Steel - ENERGY STAR® is rated 3.9 out of 5 by 783. Rated 4 out of 5 by mj9601 from Great style and look Love the look and size of the refrigerator so far. Build quality and attention to detail are surprisingly bad for such a high end appliance though. I bought this unit with my Cafe Stove and while I am very please with the refrigerator the large amounts of foam insulation that isn't cleaned off from the factory as well as plastic film stuck in many of the crevices of the mating panels was a huge disappointment. Rated 4 out of 5 by Stanch25 from Great looking fridge!! I love the fridge!! We bought it off of the floor and it has been doing a funny sound the last couple of weeks. I hope it isn’t the fan!!! Rated 1 out of 5 by Unhappy from I've had this refrigerator for 3 yrs. and have more problem with the motors going up. Replaced mo... I've had this refrigerator for 3 yrs. and have more problem with the motors going up. Replaced motors 3 times! It's very noisy as well. I know they don't make refrigerators like they use to but this is ridiculous. For a $3,000 dollars it's not worth it.